As I strolled down the cereal aisle of my Local Grocery Shop yesterday, gallon of milk in one hand, basket full of lunch fixin's in the other, I had to pause for a moment. 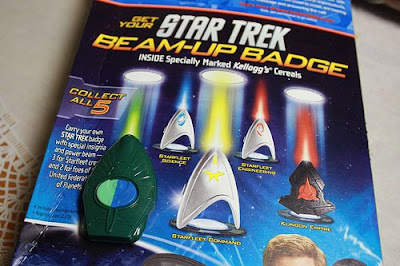 There, on the shelf, were at least three different boxes of cereal with promos for Star Trek swag on the front. I placed my gallon of milk on the shelf to free up a hand, that I might further investigate this curious happenstance. With my attention turned elsewhere, I knew full well I might unwittingly abandon the hapless jug, but this risk was a necessity. 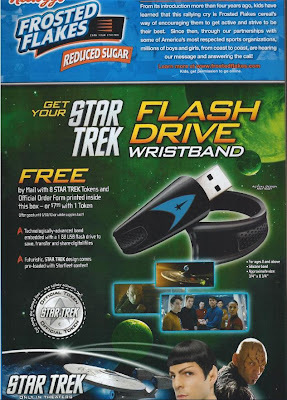 Star Trek flash drive wristbands. How quaint. They called them "beam-up" badges. I almost bought a jumbo box of Froot Loops, right there on the spot. Then I thought back to the Burger King promotional glasses as well as the action figures and model ships that were surely still occupying shelf space in toy stores nationwide. Shelf space that I, as a loyal fanboy, should be helping to free up. Star Trek was alive. Everyone knew it, and the masses embraced it. Once again, I had something in common with the world: We like Star Trek. Maybe I'm not 100% on board with the new direction of the franchise. Maybe the next movie will bomb horrifically and make audiences wish they had gone to see Nemesis instead. Maybe they'll eventually return to the original continuity for more adventures, perhaps parallel adventures--like having new issues of Ultimate X-Men and Uncanny X-Men on the shelves at the same time. So the future is a little uncertain. But the present is very clear: Star Trek lives, and it presents a choking hazard to ages 7 and under. That flash drive is absolutely awesome, but seriously... "beam-up badge"? !